Location : MANDAWA - Frescoes, Havelis and local dances. Detail Itinerary : You are picked up from Delhi, transferred to Mandawa & checked in hotel. We visit a few outstandingly frescoed Havelies in the town and watch the local dances in the evening. Location : MANDAWA - A few other Shekhawati towns. Detail Itinerary : Right from the morning we set out in the Shekhawati region to see a number of remarkable frescoes over the Havelies & Castles in the nearby towns of Dundlod, Nawalgarh and Laxmangarh. Location : BIKANER - (240kms/5hrs) Blackbucks, Bikaner City and Camels. Detail Itinerary : Before reaching Bikaner we visit the Tal Chhaper Sanctuary made popular by its overwhelming number of black bucks. At Bikaner we visit the impressive Junagarh Fort & the Bhandasar Jain temples. We mark the evening to witness the timeless spectacle of the desert with camels and sunset at the National Camel Breeding Farm. Location : JAISALMER - (310kms/6hrs) Evening over the Sand Dunes. Detail Itinerary : Starting in the morning we reach Jaisalmer by noon & check in. The only activity for the day with us would be the romantic experience of camel ride on the sand dunes at Samm with Sunset, Music, Ballads & Dances. Location : JAISALMER - The city of Maze. Detail Itinerary : We start out leisurely to see the various attractions in the town such as the incomparable & still inhabited fort, the temples, Havelis , palaces, Gadsisar tank and the maze of lanes and by-lanes. Detail Itinerary : We travel through the village of Kheechan and further through the ancient town Osiyan finally reaching the Suncity Jodhpur. 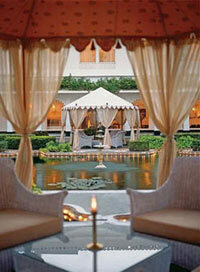 We keep the whole day free for the activity of your choice and optional dinner at Umaid Bhawan Palace. Detail Itinerary : We reach Jodhpur by noon. After some leisure we visit the Majestic Meharangarh Fort, Umaid Bhawan Palace, Jaswant Thada and the Clock Tower. We take an optional dinner at Umaid Bhawan Palace. Location : JAIPUR - (342kms/7hrs) Forts and Temples all around. Detail Itinerary : Very early morning we visit the one and only Brahma Temple. After breakfast we proceed for the final destination of our tour which is the city of many faces & ages as Pink City - Jaipur. We visit the Birla temple, the high posted Jaigarh Fort and the charming Nahargarh Fort from where the view of sprawling Jaipur city in the evening is unforgettable. Location : JAIPUR - Amber ride, endless shopping and Rajasthani Dinner. Detail Itinerary : Whole day we visit the various interesting parts of the city and the Amber Fort (Elephant ride). For the evening we wander through the unending bazaars of the Pink city. For the dinner we try out some Rajasthani delicacies at the ethnic village in the typical rural atmosphere. Location : JAIPUR - The spiritual touch at the end. Detail Itinerary : Very early morning we can try out the option of taking the spiritual tour of the old city & temples. Rest of the day free till departure for the onward journey.